Rose of Arden: What is Canal Heritage? Wiki says: Heritage refers to something inherited from the past. The word has several different senses, including: Natural heritage, an inheritance of fauna and flora, geology, landscape and landforms, and other natural resources. Cultural heritage: the legacy of physical artifacts and intangible attributes of a group or society or man-made heritage. Industrial heritage: monuments from our industrial culture. Inland Waterways International IWI brings together people and organisations who support the conservation, use, development and proper management of inland waterways worldwide. It aims to raise public awareness of the benefits of using waterways for a wide range of activities, from inland water transport to cruising, towpath walking and other recreational uses, as well as appreciating their architectural and landscape values as important heritage. It also promotes restoration, where appropriate, of waterways which have become derelict. Its membership includes leading navigation authorities, as well as voluntary bodies, museums and commercial companies. The Canal and River Trust is a corporate member of the IWI . Individual members include both users and experts in the various disciplines. All have a keen interest in both the history and the modern significance of inland waterways for commercial carrying and recreational use. The Groningen Declaration, seeks to establish a set of guidelines for integrated care for canals that have lost their prime function or maybe never provided an economically viable means of transporting goods and people. Care for these canals has often been transferred to new custodians whose interest is confined to a limited perspective, such as recreational use, water storage and water quality, or water management. A wide variety of players are involved in and around canals, who all invest time, effort and money. The Groningen Declaration aims to stimulate parties within these fragmented interests to coordinate their efforts towards the integrated development of canals and inland waterways. The objective is to protect and reinforce the spatial quality of waterways, to fight neglect and deterioration, and to enhance their qualities. The quality of the resources deals with the integrity of the actual canal and its associated facilities, its use, maintenance and preservation, including values, buildings, skills and objects of historic, cultural and spatial significance. New developments on canals should be in harmony with historic values and should not lead to fragmentation of banks or towpaths, or disturb significant sightlines related to canals and connected infrastructure. A heritage impact assessment should be required for new developments that may have an impact on the significance of canals and their setting. Historically relevant objects related to canals or other infrastructure connected to the function and use of waterways should be preserved. Ongoing monitoring should be set up to prevent decay, loss of significance or trivialization of canals and to ensure improvement in preservation, management and interpretation practices. The versatility and diversity of the entire landscape related to the waterways should be safeguarded. Historical waterways should be reconnected with each other where possible in order to increase the scale of the recreational use of the water network, which will provide better incentives for its maintenance. 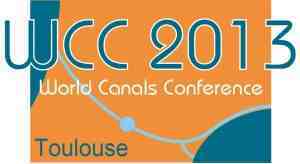 Historical qualities of canals should be treated with more care in the spatial planning process, because they can be a source of inspiration for future spatial development. The quality of the experience encompasses the way in which visitors and users experience the canal, from the water and from the bank. We aim to satisfy the needs and exceed the expectations of users and visitors, and continuously improve our services to enhance the experience. Panoramic views from waterways and on waterways should receive a protected status. Visibility of the water-related infrastructure has a positive impact on the visitor experience and helps to raise public awareness of the historic values of waterways and their environment. Canal management has to guarantee open vistas from waterways onto the land and vice versa. The banks of historic waterways should be retained in the public domain, so that they can also be utilized by hikers and bikers, as well as anglers and horse-riders where feasible. Special attention should be paid to the landscaping alongside canals, preferably in harmony with the cultural and natural setting of the canal. Custodians of canals should provide information on the canals and community resources available at easily accessible locations, and also make information on historic waterways available digitally, through their websites (or through the associated web sites of related canal associations and societies). The quality of use addresses the way in which canals are maintained in order to preserve their original purpose and usefulness. Rehabilitation of canals should be executed within a wider social and economic perspective. Rehabilitation is not only the conservation of what has been, but also the creation of an asset that can be used. The original design draught should be provided wherever possible, to preserve the possibility of use for commercial carrying or for moving urban waste or materials to recycling plants. An integrated approach should be applied to the rehabilitation of canals. Only by combining knowledge, resources and efforts will it be possible to revitalize canals as a vital aspect of society, sustained by the community. The quality of life aspect is the sustainable and economically viable development of communities alongside the canal. Any initiative aimed at the revitalization of canals should consider the local community as a major stakeholder. An assessment should be made of the long-term economic viability of any project, and the social impact of the intended development. The local population should be able to gain economic benefit from the development in terms of jobs and spending capacity. Interdisciplinary involvement should be standard practice in conservation and management settings. Professional training, interpretation, community education and public awareness should be encouraged to support the sharing of knowledge, as well as to promote conservation goals and improve the efficiency of the protection tools, the management plans and other instruments. Use it why lose it. Looking at our UK inland waterways, their heritage plays an enormous part in the attraction for people to come on or near a canal. The Industrial Revolution, the amazing accomplishments of the large groups of Navvies and the canal engineers who are now household names. Its hard to define a time when heritage begins. Typical of this might be the new CaRT logo which replaced the "old" BW logo which first came into use in 1981. There being 30 plus years of use. An attractive logo that was instantly recognised by many people. A logo that I certainly preferred to the "Angry Swan" logo now being deployed at great expense. Placed side by side, the iconic reed mace and the characteristic hump backed bridge say volumes about what the logo represents. Compared with the outline of a swan displaying an angry "wings arched" stance, conveys absolutely nothing. I thought it at the time and I still maintain it now - it was a retrograde step to throw away an icon of our recent heritage. One that was well worth preserving. There are many things that also carry the look and feel for the heritage of the canals. One of them is the Cast Iron waterpoint standpipe. Somehow the sculpted look captured an image in keeping with the Victorian cast iron culture. Now it seems these are being removed and replaced by a stainless steel monstrosity that has as much to do with our canal heritage as an android phone. Take any heritage listed building on any street in the UK. Then add a stainless steel box on the wall and you would create a huge backlash of condemnation about tasteless vandalism! CaRT says "We’re also currently undergoing a programme to standardise the water points on our network and installing new vandal free taps, which will cut down on the cost of maintenance. New water regulations mean that over the next two years we will have to review the design of our water points. It means that flexible hoses can no longer be permanently fixed to taps, and we will have to make some changes to taps and valves to make sure they are compliant." I am sure that there is a trustee charged with overseeing/protecting the canal heritage. Can someone give them a nudge and let them know what's happening on their watch. Did anyone involved in the change take the most brief glimpse of the heritage rich cast iron standpipe. Did anyone contemplate designing a replacement that encompases the cast in iron look? Did anyone notice that the black and white painted cast iron look blends in with many of the cast iron bridges? This whole process should be halted now. 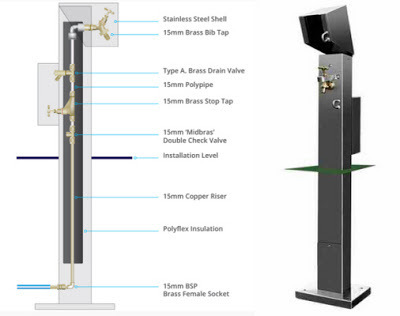 Whoever came up with the idea of replacing the traditional cast iron stand pipe and replacing them with a shiny stainless steel pillar and box should be sent to the naughty step. The cast iron standpipes are as much part of our canal heritage as the post office pillar box on the high street. Where possible, replace with a tasteful design that mimics the traditional cast iron look using materials that will comply with any appropriate regulations in force at the time. The Ridgacre Branch is a canal branch off the Wednesbury Old Canal, part of the Birmingham Canal Navigations. It opened in 1828, to serve collieries and iron works, and was disused by the 1960s. Except for its branches and a small section at the eastern end, which have been filled in, most of it is still in water, but it is not navigable as a low-level bridge carrying the Black Country New Road spans the entrance. In a recent comment, John one of my readers reported the following. He wrote: "Last month I reported a blocked bridge hole (two fallen Silver Birch trees) and a weed covered section (about 100 Yds long) blocking the Ridgacre branch canal. The [CaRT] response included this line. "We can confirm that we are very committed to keep all of our canals and there is definitely no intention of us closing and losing this section." Very good, but the email then went on to state. "We have previously investigated the option to dredge it but given the level of contamination and the cost to dispose of these dredging's it is currently unrealistic for us to do so, especially when you consider that we are not always able to dredge the frequently used canals as much as we would like." Not so good, the longer it is left the worse it will get and the more expensive it will be to clear, the email then stated that. "We are aware of this issue being raised on local boaters forums recently so we have addressed it with the local BCNS and told them of our plans and asked for their advice. They agree with our thoughts and have stated that they will not promote its use as part of any rallies." So there is now a part of the canal system, admittedly not frequently used, for which the official policy (supported by the local canal society) is not to promote its use. At the moment it possible to cruise the first 200 or so yards of the Ridgacre Branch, before being blocked by the weed growth. With an attitude of not promoting its use, how long will it be before the whole branch is lost? In my part of the world, whenever there is trouble with the bottom being a bit close to the top. A CaRT workboat is used to plough then blast with the prop a clear channel through the middle of the blockage. The passage of other boats then also helps to plough the channel clear. I love the BCN we spent three months last year around the area. To me, letting the canal deteriorate to the point where it might as well be abandoned speaks volumes about commitment. Restoration and maintenance are paramount and we should never suggest that any part of our industrial heritage as not worth the effort.